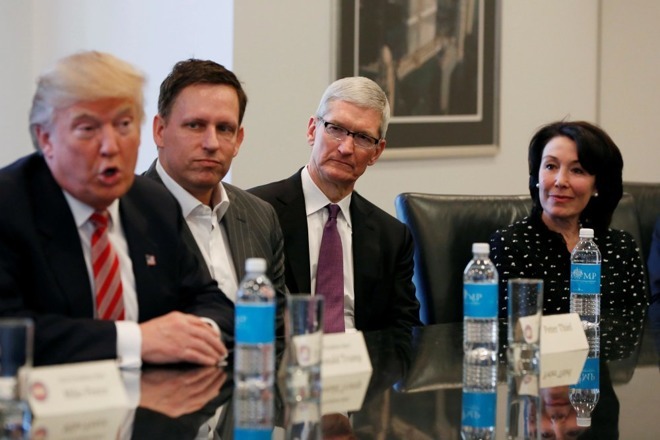 Apple CEO Tim Cook is reportedly among a number of corporate and political leaders trying to persuade U.S. President Donald Trump not to pull out of the Paris climate change agreement. Cook called the White House on Tuesday, hoping to pressure Trump into holding to the deal, according to a Bloomberg source. A number of other business leaders have been working along similar lines, such as Dow Chemical's Andrew Liveris, who organized a letter from 30 executives. TV ads from 10 of the country's "biggest CEOs" are now airing on TV, promoting the job and manufacturing potential of the agreement. A full-page print ad from 25 companies like Intel and Microsoft is due to run in the New York Times and Wall Street Journal on Thursday. Meanwhile, Tesla/SpaceX CEO Elon Musk has threatened to abandon White House advisory councils if Trump goes against Paris. Like Musk, Cook has been aiding the White House when needed. Opposition is also said to have been stiff during Trump's first international trip, including arguments not just from political leaders, but Pope Francis. Earlier on Wednesday, Trump revealed via Twitter that a decision on the Paris agreement is coming "over the next few days." Some sources have claimed, however, that Trump has already decided to pull out. Despite global scientific consensus, Trump has often been skeptical of human-caused climate change, at one point suggesting the idea was a hoax perpetrated by China. The President has also frequently painted himself as a supporter of the coal industry, which has sometimes decried the Paris agreement. Coal companies and jobs are liable to decline as the U.S. and the world transition to cleaner, renewable energy sources.